I was sorry to see Evelyn Anthony’s obituary in today’s Guardian, but I suppose she did have a fair old innings. I devoured her books in the 1970s and have only just begun to buy any books by her that I see, I gave all my old ones away years ago in an effort to de-clutter prior to moving house, I’m sure you know what that’s like. Anyway, if you’re interested in reading Evelyn Anthony’s obituary have a look here. I’ve just realised that her obituary was published online on October 10th, but didn’t appear in the physical newspaper until October 31st. They must have a backlog to work through in the newspaper! One of the best things about travelling around the UK is having the chance to visit different secondhand bookshops, not that there are that many of them left nowadays mind you. However, I did manage to buy eleven books on our recent trip to the Lake District, Derbyshire and Peterborough. The Star Spangled Manner by Beverley Nichols – first published in 1928 but my copy is from 1937. It’s obviously his thoughts on America, a place he travelled in extensively. It’s a very nice and clean copy in fact I think it might never have been read. The Sea for Breakfast and The Loud Halo – both by Lilian Beckwith. I’ve never read anything by her, but her books were very popular when I worked in libraries yonks ago. Again the books are in great condition, I love the covers. 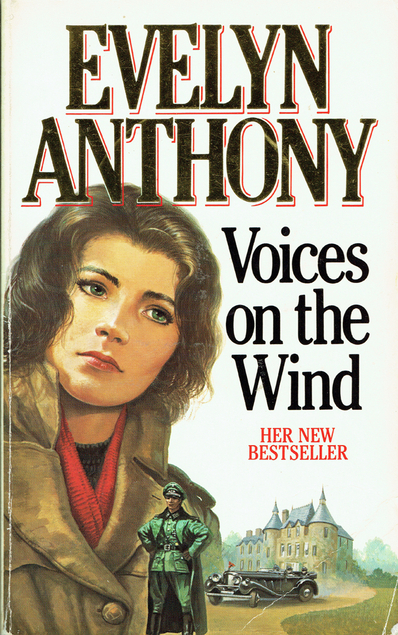 Somewhere, I can’t remember where, I bought Voices in the Wind by Evelyn Anthony. I used to read her books back in the 1970s but this one was published in 1985. I bought a few books aimed at children: Pigeon Post by Arthur Ransom, Flight of the Grey Goose by Victor Canning and The Indian in the Cupboard by Lynne Reid Banks. Over the Mountains by Pamela Frankau turns out to be the last in a trilogy, so I’ll have to track down the first two. The Blessings of a Good Thick Skirt by Mary Russell which is about women travellers and their world. Lastly I bought a nice old copy of In Search of England by H.V. Morton This book has been reprinted a lot since it was first published in 1927 but my copy is from 1943 – complete with dust jacket. Not a bad haul I think. Have you read any of these books? No Resistance by Evelyn Anthony was first published in 1967, but at somepoint the title seems to have been changed to The Rendezvous, – so confusing. I remember way back in the 1970s I devoured these books which are mainly set in wartime, often spy stories. I had no idea that this was the first such book which Anthony had written, despite having had a lot of books published before this one, they were all historical fiction. I don’t recall ever reading any of those ones – have you? In No Resistance a young female French resistance agent Terese Masson has been arrested by the Gestapo. She’s interrogated by Colonel Alfred Brunnerman who employs psychological techniques to get information, but she knows that eventually he will have to hand her over to the torturer, if Brunnerman’s techniques fail. She’s terrified, but at the same time very attracted to Brunnerman. Years later Brunnerman and Masson meet up in America where they have both settled. Brunnerman has changed his name and nationality to dodge prosecution, as a Nazi originally and latterly to foil the Israeli execution squads which are tracking down ex-Nazis. This is the type of romance full of suspense which I find to be very enjoyable.